The idea of the new development and actions on the Targ Węglowy square came at a time when the parking function disappeared from the historic square. 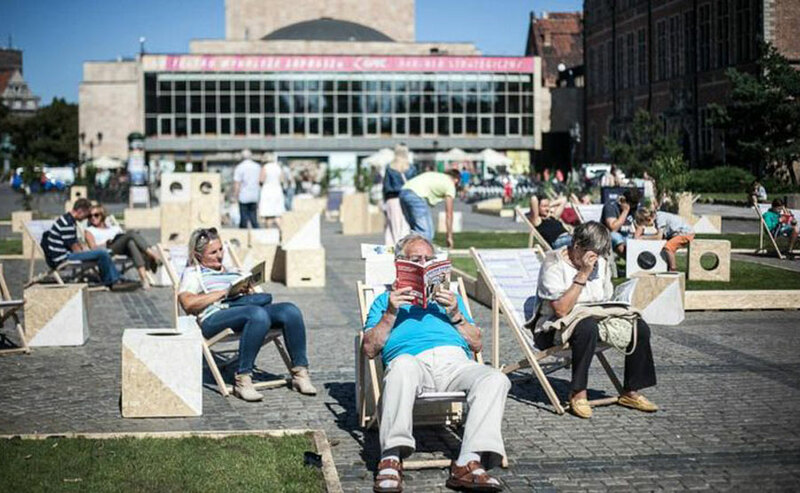 Car-free space presented the opportunity to propose a new, organized public square, which the Main City in Gdańsk lacks. City Culture Institute in collaboration with GDYBY group proposed temporary space in the form of urban grassland rooms, as one of the many possibilities of organizing this place and to inspire some subsequent actions. The form of the design was a result of its temporary character and a relatively small budget, but also a need to neutrally interfere with historical surroundings. The main idea was to drag the citizens into kind of a game, in which they participated from the moment they entered the square. Users had the opportunity to create their own little spaces in which they felt comfortably. Kids were creating their ideal playgrounds and geometrical compositions, while adults used cubes as tables, seats and space divisions. The whole arrangement was completed with natural grass areas which created “rooms” and gathered people around them.